Seems to be year of the blends, white blends the strongest category (very lucky to sit on this panel) with eight 5 star wines, red blends got five 5 stars same as Cabernet Sauvignon and Syrah but red blends the biggest category in 'highly recommended' by some distance followed by white blends, Chenin Blanc, Syrah, Chardonnay and Cabernet. There were also 9 wineries achieving 5 Stars for the first time – these were Creation Wines, Crystallum, Diners Club Bartho Eksteen Academy, Fram, Iona, Oldenburg, Porseleinberg, Stellenbosch Vineyards and Sumaridge. 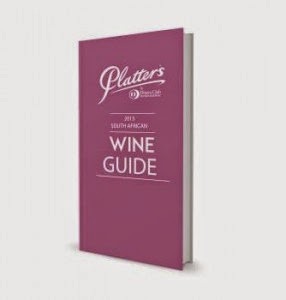 The Platter Guide 2015 will be on sale from mid-November priced at R195 and is also available online from Platter’s website (www.wineonaplatter.com). The web-based version of the guide is available at www.wineonaplatter.com. The tradition of secrecy and minor fanfare surrounding the colour continues with this year's colour announced as Beaujolais Ferment. “Chenin’s time has come,” says Ken Forrester, head of the Chenin Blanc Association. Understanding the history of Chenin Blanc is understanding the history of Cape wine. For prominent international critics it is nigh on South Africa’s signature variety and symbolic of South Africa’s rising above its burden of history. Is Cabernet a Fit King? While some doubt remains surrounding Cabernet’s credentials as the king of red grape varieties, it emerged earlier this year that Cabernet Sauvignon is the world’s most widely planted variety. In the Cape it’s also now the most widely planted red variety, just ahead of Syrah. With the Cape’s longer viticultural history dominated by white varieties like Chenin Blanc, Semillon and Colombard, it is uncertain exactly when Cabernet was introduced to the Cape but Cabernet’s plantings have been increasing since the 1970s after having been planted in Constantia around the mid-nineteenth century. Stellenbosch Farmer’s Winery (SFW), a Distell forerunner, created legendary Cabernet-based blends in the 1970s that were still drinking very well more than 30 years later. These blends often contained Cinsaut (or Hermitage as it was known locally, although there is no Cinsaut in the Northern Rhône) and smatterings of Shiraz. Cinsaut was the Cape’s most important red wine vine until the 1960s and is a parent, along with Pinot Noir, to Pinotage. International tourist arrivals to South Africa in 2013 almost touched the 10-million mark – a new high – and, last week, newly appointed Tourism Minister, the ANC’s Derek Hanekom, addressed Parliament, saying that bold new initiatives are needed to further grow the number of visitors to South Africa. Mr Hanekom has good reason to be a little anxious about emulating his predecessor Marthinus ‘Kortbroek’ van Schalkwyk, under whom the industry contributed R93-billion to South Africa’s GDP and achieved “a staggering annual average real growth rate … of 7.3% over the past 20 years” in 2012. There is a sound argument that one of the sectors Mr Hankom should look to is wine tourism. South Africa’s wine tourism in 2012 was rated the best-developed in the world by International Wine Review. “In 2009 wine tourism contributed an estimated R4.3-billion to our country’s tourism revenue, and we believe there is still great potential for growth in this regard,” Mr van Schalkwyk reported in 2012. You may expect to find one of South Africa’s best food and wine pairing experiences – and best Bordeaux winelist – in Cape Town’s foodie precinct Woodstock, yet for this one you need to drive about 95 minutes east to bucolic Stanford where five kilometres outside the village, down a gravel road close to the ocean, you will find Springfontein, a wine farm, and its restaurant Springfontein Eats. Here you will also find, in the vineyard and the cellar, Tariro Masayiti; in the organic orchard, herb and vegetable garden, his horticulturalist partner Hildegard Witbooi; in the kitchen, Michelin-star chef Jürgen Schneider and his wine expert and Riesling fan wife, Susanne. Some say craft becomes art when practised over time and you can witness it at Springfontein. Jürgen has worked in butcheries and kitchens for over 40 years, while he and Susanne have been working together for close to 30 years, for 18 of which they held a Michelin star in homeland Germany. Susanne knows Jürgen’s food intimately and she knows her wines – the result is one of the best food and wine pairing experiences in the country. Having emerged from its position as the only country to prohibit any mention of vineyard origins on its wine labels, South Africa has embraced the age of single vineyards with 352 now registered (see Single Hit Parade #1). To some single vineyards are the cathedrals of viticulture and represent the ultimate sense of place, to others simply painting in black and white. The notion of single vineyard is hardly new with the monks of Citeaux some 1 000 years ago parcelling out the climats of Cote d’Or based on the observation that year after year certain parcels always produced wine of recognisable character and quality. Today, some of Domaine de la Romanée-Conti’s single vineyard Pinots are among the most sought-after in the world. Other varieties to have produced among the finest single vineyard wines of the Old World are Riesling, Nebbiolo and Shiraz. In the Cape, registered single vineyards are dominated by Shiraz (180), Cabernet Sauvignon (167) and Sauvignon Blanc (145), up there with Riesling as aromatic white wine. Pinot Noir comes in at eighth (51) after Chenin sixth (67) and Pinotage seventh (68) in a more true reflection of our heritage. Most singletons hanker for a committed relationship yet, not long after entering one, can suddenly find they quite fancied the single life. Ancient in Europe, the notion and practice of single vineyard viticulture is relatively new in the Cape. Twelve years ago, before it was even permitted, there were around 100 practitioners – now there are more than 350 registered single vineyards with a concomitant decline in registered estates. The estate classification also crumbled as a result of natural use-it-or-lose-it laws (largely self-inflicted) and the many exceptions to estate membership the law allowed. The days of the estate are over, a bit like some traditional marriage vows and conventions. Not too dissimilar to single parenting these days are ‘units for the production of estate wine’ and ‘estate wine’ on the label with reference to the wine rather than the property. There is no such thing as an estate in terms of the Liquor Products Act. What it does contain is a ‘distinctive’ wines classification, which stipulates that the Wine and Spirit Board (WSB) may approve ‘grapes grown on specified land in a district or ward with a view to the production of a distinctive wine of the district or ward concerned’.